Who’s ready to kick off summer with our favorite summer offer? 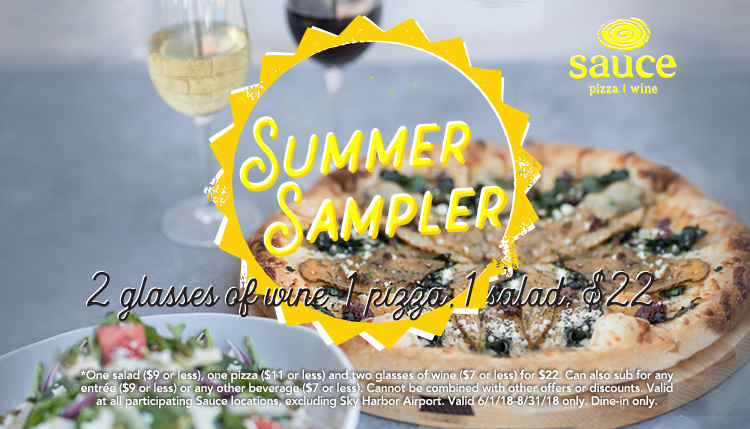 From June 1st until August 31st you can enjoy our #SummerSampler. Enjoy 2 glasses of wine 1 pizza, 1 salad for just $22*. So, grab your sunscreen, put on your favorite pair of shades and start summer off right! If you’re looking for a refreshing way to cool down, think Watermelon & Arugula Salad. This seasonal salad is packed with fresh seedless watermelon, spinach, arugula, jicama, roasted pumpkin seeds, feta cheese and dressed with our house made white balsamic vinaigrette. The perfect addition to your Summer Sampler. *One salad ($9 or less), one pizza ($11 or less) and two glasses of wine ($7 or less) for $22. Can also sub for any entrée ($9 or less) or any other beverage ($7 or less). Valid 6/1/18 – 8/31/18 at all participating Sauce locations, excluding Sky Harbor Airport. Dine-in only. Cannot be combined with any other offers or discounts. Limit one per guest per visit.